Why Do I Have a Black Line Around My Crown? Black line covered by bonding on this dental crown. Why is there a black line at the gums with my crown? As you can see on the photo to the right, there is a dental crown on an upper front tooth. In this case, because of an unsightly black line right where the crown meets the tooth, bonding was placed over it. Unfortunately, that didn’t make things look much better. A black line at the margin of a dental crown can develop for many different reasons. Those reasons will be discussed in detail later on in this article. But the most important point is that an ugly black line can be fixed! 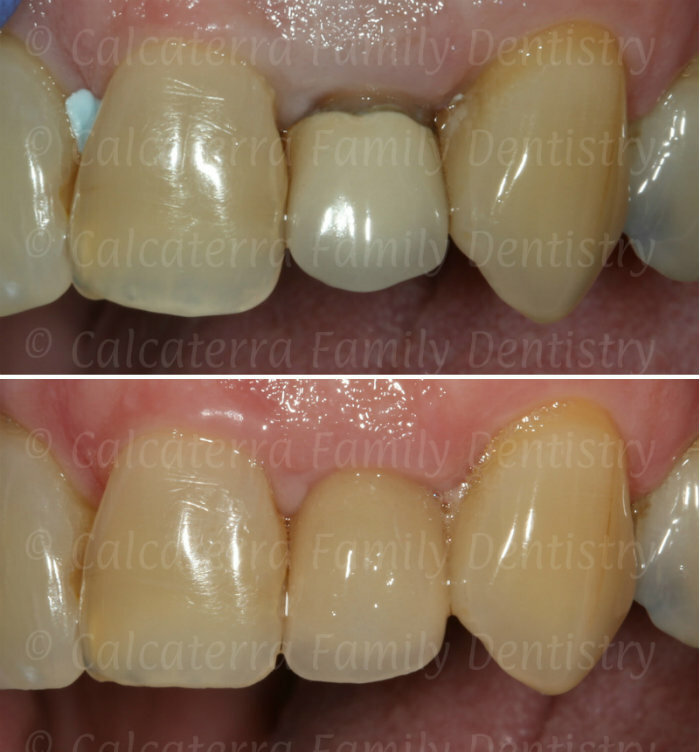 Before and after photo showing the dramatic fix of a black line around an old crown. With a new all ceramic crown (specifically an e.max crown), his smile was transformed immediately! Photos and dentistry Dr. Nicholas Calcaterra. This patient of ours from West Haven lived for many years flashing this every time he smiled. He did not believe that it could be fixed. We believe we convinced him otherwise. What do you think? Fixing it took extreme attention to detail and a new all ceramic crown. Note the shade match – it matches the adjacent teeth so well you can’t even tell it’s a crown! Why Are There Black Lines? 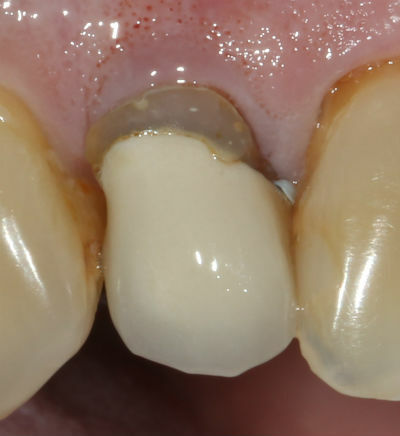 Placement of a porcelain/metal crown in a way so that the underlying metal is visible. This could have been avoided with an all ceramic one. Significant recession of the gum tissue following placement of the crown. Significant darkening of the underlying tooth so that its shadow becomes visible under a very thin layer of porcelain. 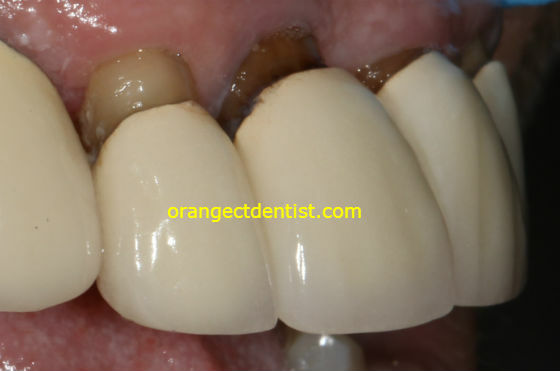 Leakage and/or staining from an old filling on the tooth under the crown. Caries (a.ka. decay or a cavity) that develops at the margin. Black lines – along with brown colors – visible on these front crowns. We DID NOT do these crowns! The above photo shows three front teeth. The black and brown originate from several factors – the use of porcelain/metal crowns, recession of the gums, and leakage/staining from old fillings. Ouch! Black Lines Can be Fixed! As the before and after photos show, nearly all cases of black lines can be corrected. To do so, your dentist first must understand why it occurred, and then he/she must pay extreme attention to every detail to correct it. Are you unhappy with your front crowns? Interested in learning to see if we can improve the appearance? Call us at (203) 799 – 2929 or visit this page to request an appointment.